So it has been a while since I have posted anything we've done. I had great plans for this year, but things have not quite gone as planned! We have had a rocky start to the year with family, business and housing all turning our lives upside down. We have only gotten through by the grace of God and the love and generosity of our brothers and sisters in Christ. We are not through it yet but life and school must go on! Now that we are starting to swim again, instead of drowning we have been able to get some routine back in our days and started back up with our school work. 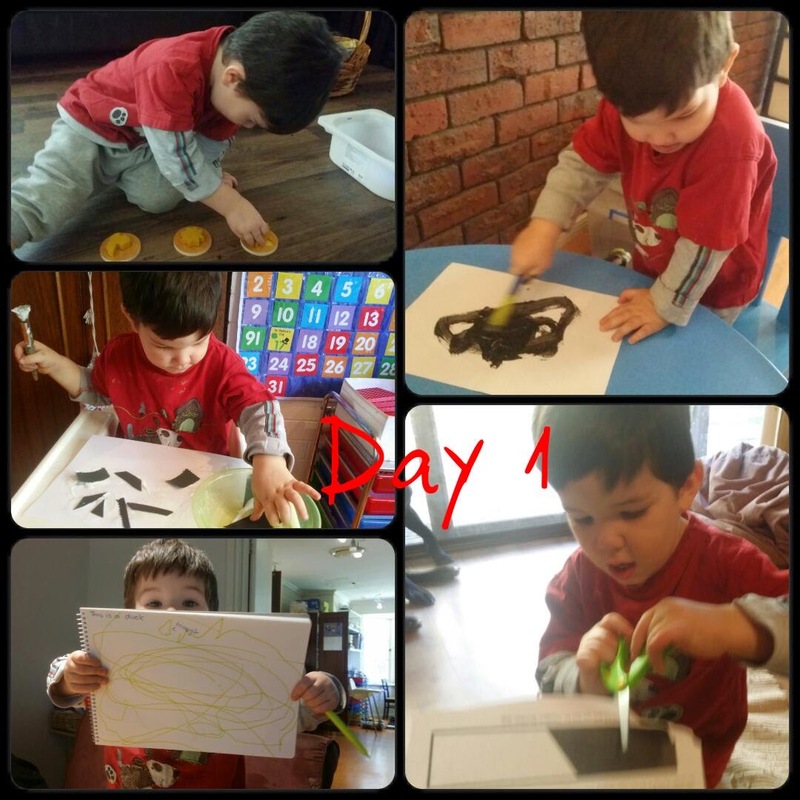 I have started using a new curriculum with Samuel and Nathanael. 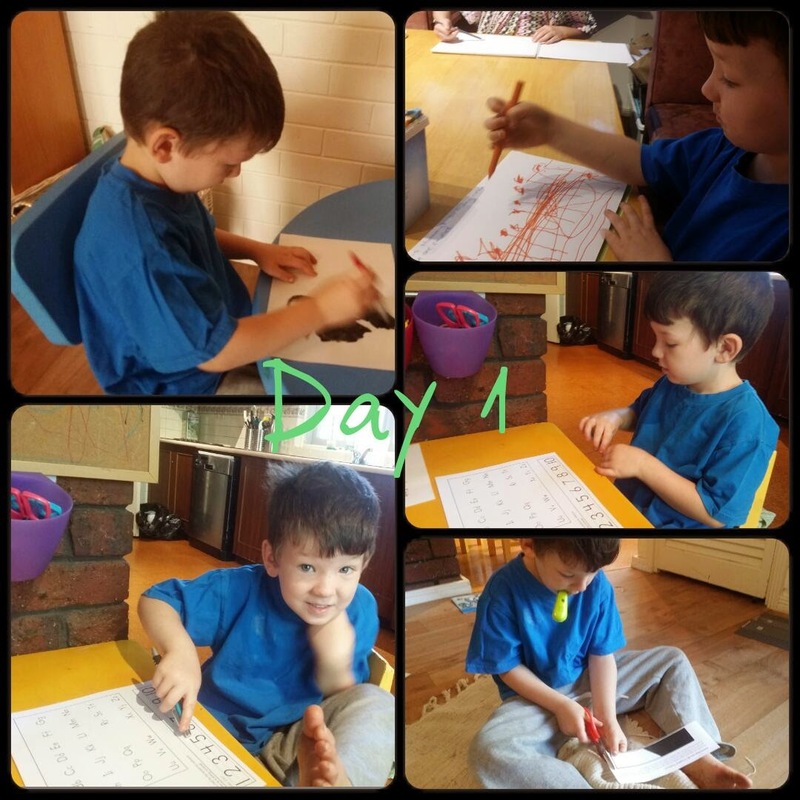 We are using My Father's World Kindergarten (pre-primary for Australia) We looooove, looooove, looooove all the My Father's World levels we have used so far but this is the first time I have used their K one. So far it looks just perfect for Samuel. It is very Charlotte Mason in its style so is a very gentle approach to learning that doesn't push academics at this young age. It feels like it will be just the right speed for my special little boy. Nathanael will join us for the Bible and Science parts of the program and I will work just with Samuel on the Maths/language parts. The first two weeks of the curriculum is an overview of the creation story before launching into individual units for each letter and learning to read. Here is a look at what we did this week. On day 1, God made day and night. We started off reading the creation story focusing on Day1. After reading it we found the darkest room we could and took turns saying, "God said, Let there be light!" and turning the torch on to make light. It is amazing how much fun something so simple can be for a 5 year old and a 2 year old. They would've spent all day doing that if I let them. We also practiced our cutting skills but cutting out the number 1 for our creation wall poster. 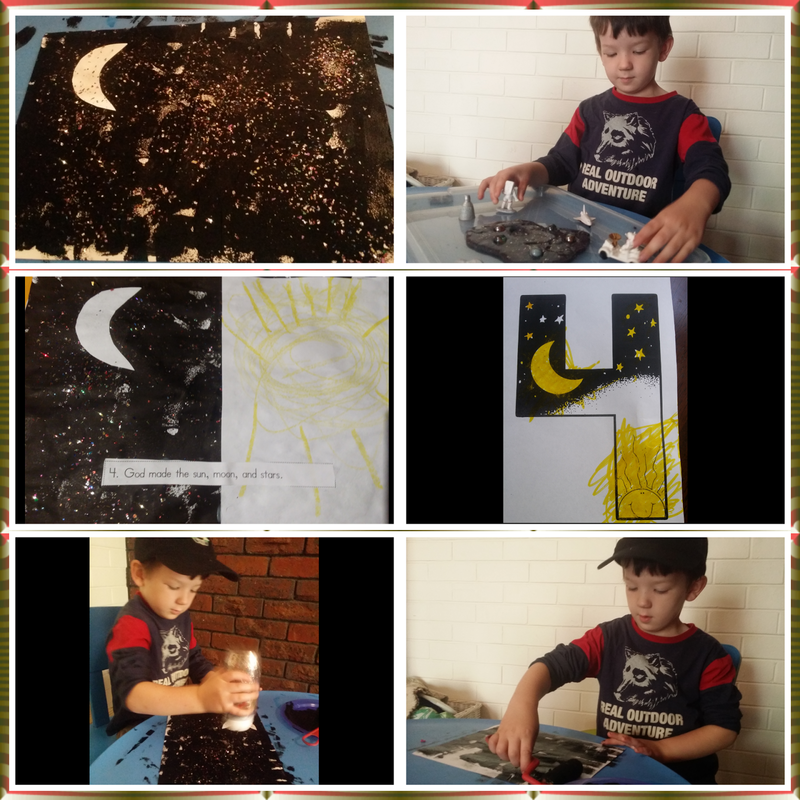 Nathanael made a "light and dark" collage while Samuel and I reviewed our letters and numbers and then we made our day and night painting for their creation booklet. We also started journal writing. Samuel drew a picture and dictated a story to me about my birthday and Nathanael drew a duck and a triangle!! On day 2 God separated the waters below and the waters above. 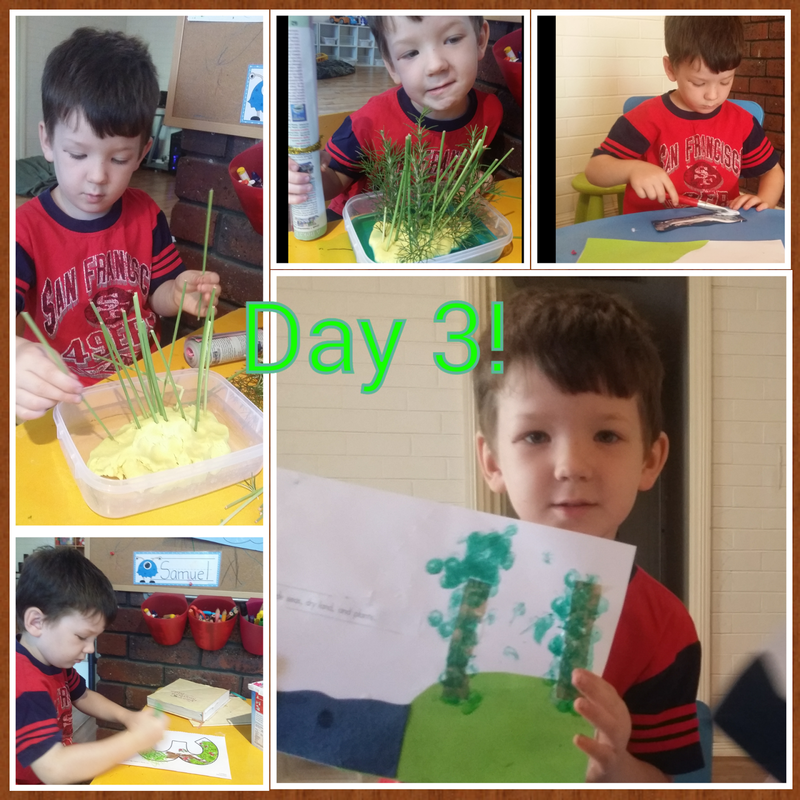 We painted and cut our our number 2 while I read the creation story again and then we made rain clouds. 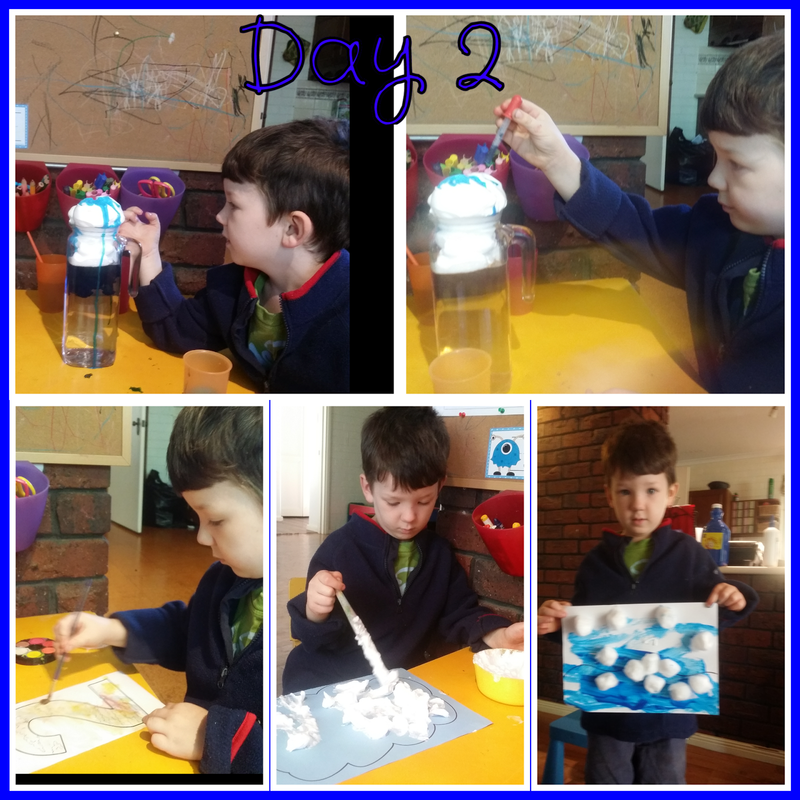 We used a jar of water with shaving cream clouds on top. 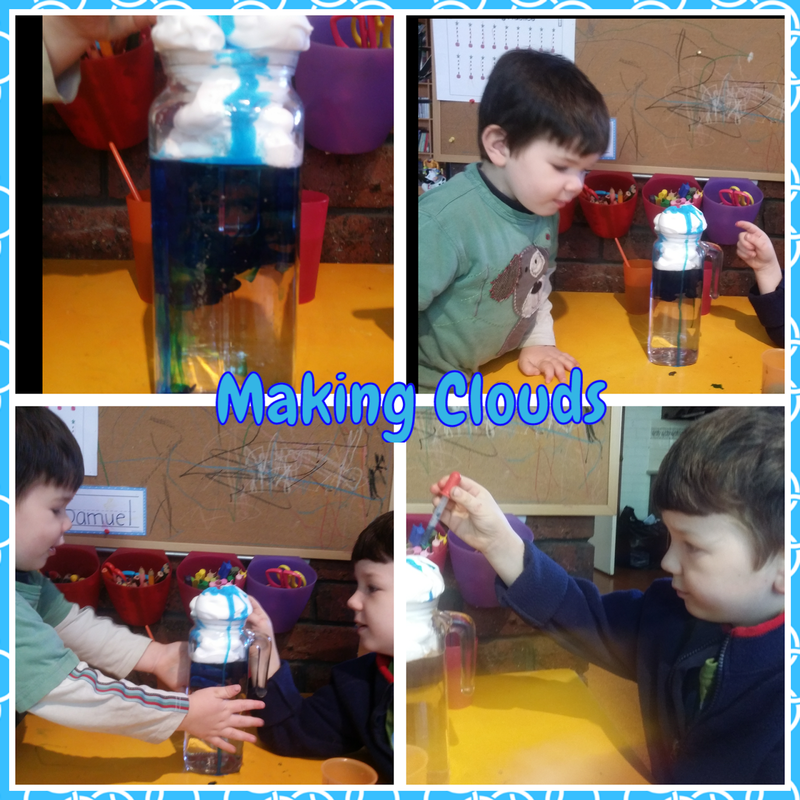 Then the boys took turns dropping blue water onto the cloud until it started raining into the jar. This experiments looked really cool and even the big kids had to get in on the action and have a turn. 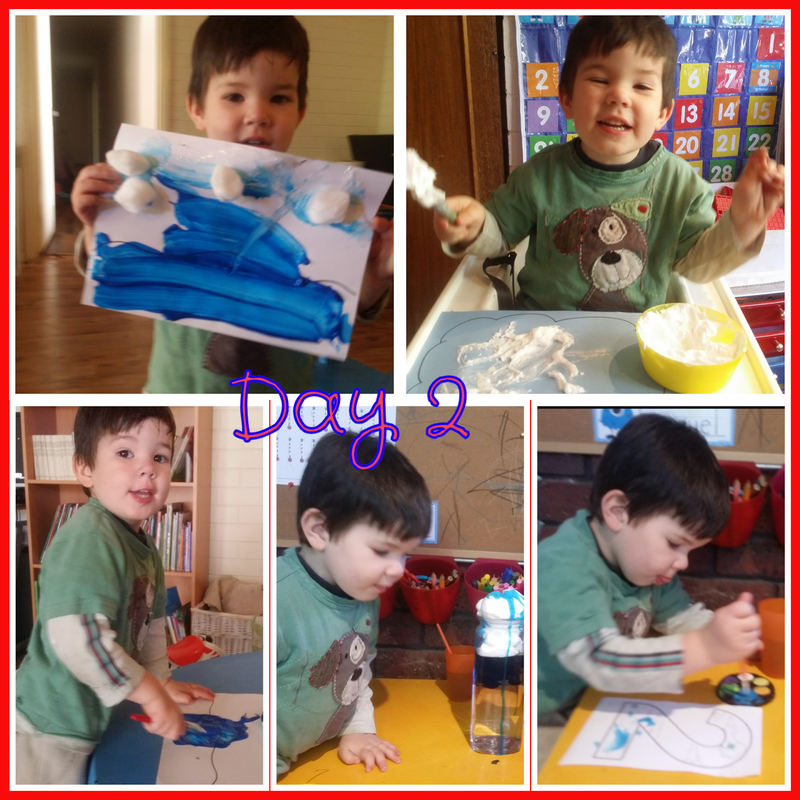 After that the boys painted clouds with fluffy shaving cream paint. For our creation booklet page they painted the ocean and stuck on cotton wool for the clouds in the sky. When we were done we went outside cloud spotting. On day 3 God created dry land and the trees and plants. 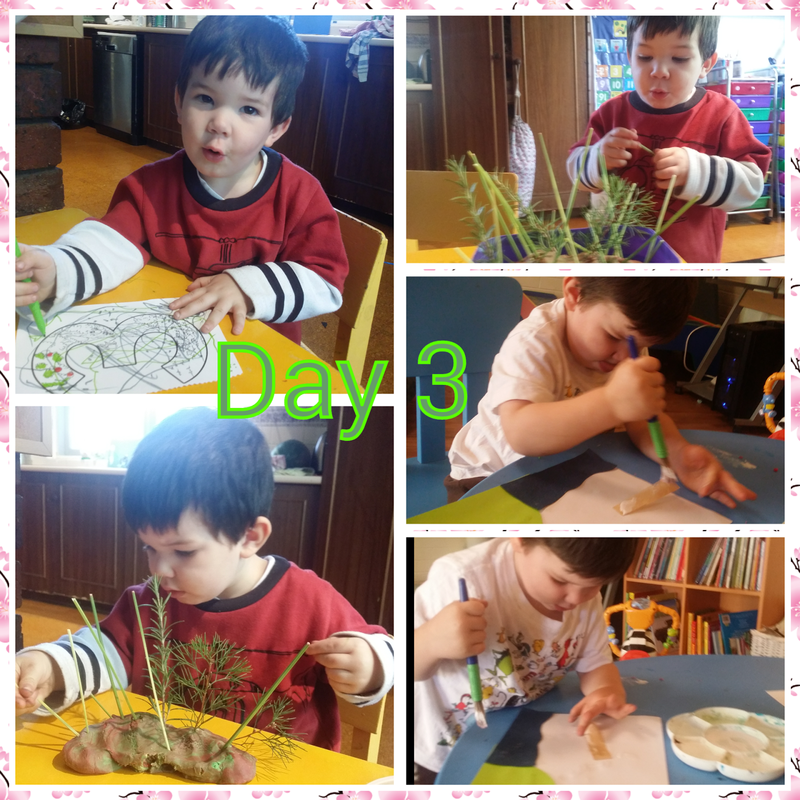 After reading our story and colouring and cutting our number for the creation wall poster we went outside and collected some leaves and twigs. We used some playdoh and shaped it into a continent and put it in the middle of our "sea" of food colouring and the planted all of the leaves we had collected. Our creation book page involved lots and cutting and gluing of water, land and trees. On day 4, God made the sun, moon and stars. Nathanael is space mad at the moment, so this was by far his favourite day. After reading our story and reviewing all the things God had made so far we looked at some of our space books and talked about all things space. 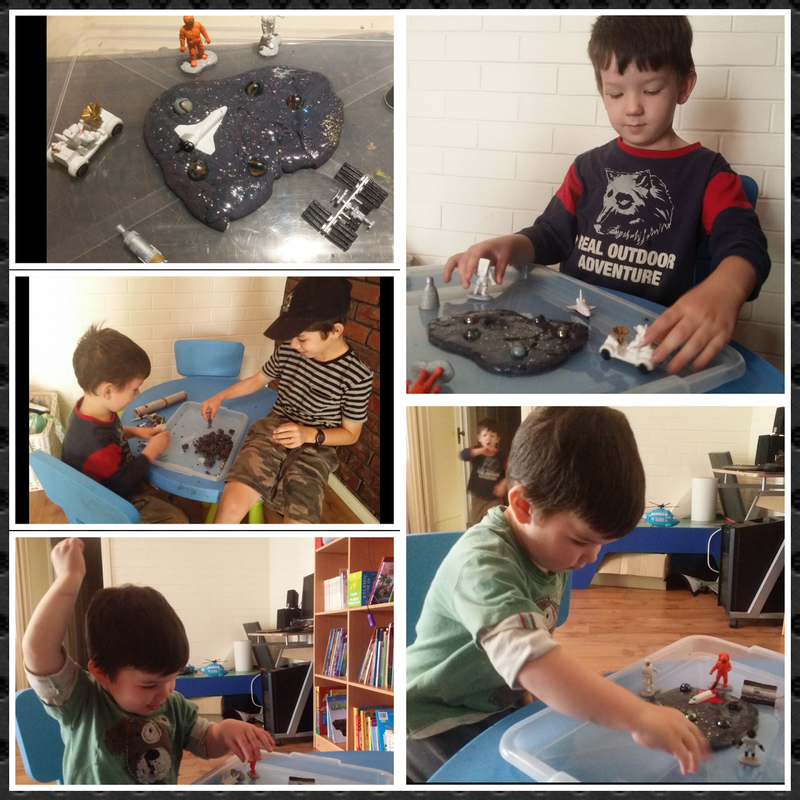 Together we made some sparkly space slime to which we added our astronauts and rockets. Not exactly creation but lots of fun!! The boys played with this for over 45 mins and probably would've spent longer but I left the glitter down and when I left to go and work with the older kids, Nathanael took the lid off and dumped the whole jar onto the slime. Needless to say the slime was packed away after that!! 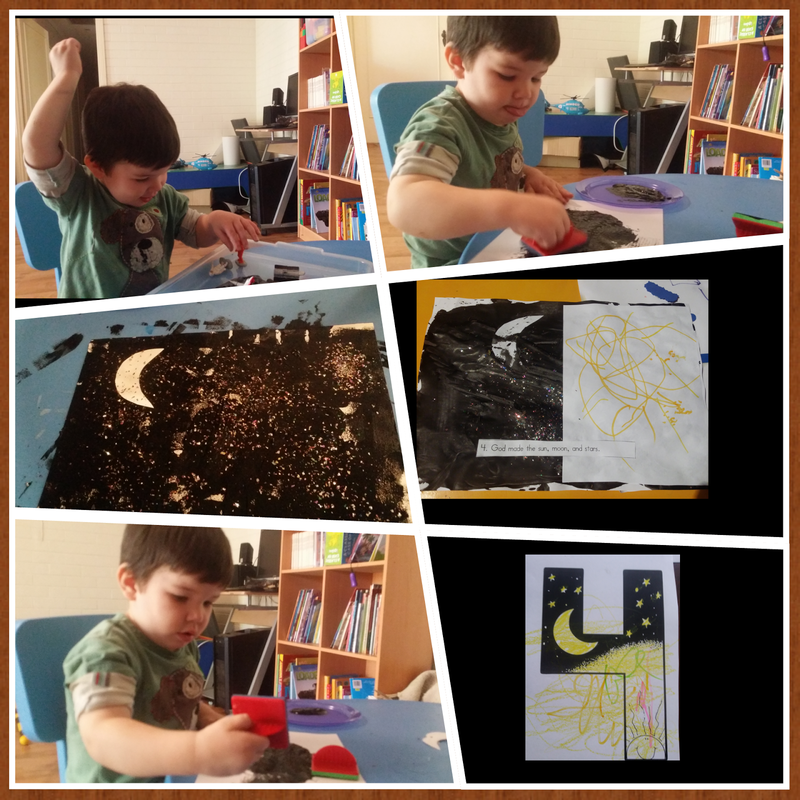 Once the glitter and the boys were cleaned up we made our creation booklet page by painting on side of the paper black and sprinkling on some of the glitter off the floor for stars, sticking on a moon and drawing a sun on the other side of the paper. All up we had a great first week back and I am really looking forward to finishing off our creation unit next week!